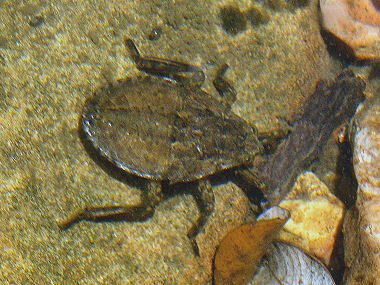 The Ferocious Water Bug is a member of the Giant Water Bug Family. The bug is shaped like a flat, oval disk and is twice as long as it is wide, reaching almost 1.5 inches in length. It is dull brown in color and has prominent compound eyes, a strong beak, and fore legs adapted for grasping and holding prey. It typically lives in slow moving streams and ponds; usually under rocks. The bug is adapted to swimming, but it can't breathe underwater. When it needs to breathe, it rises to the surface, where it sticks out breathing tubes for air. 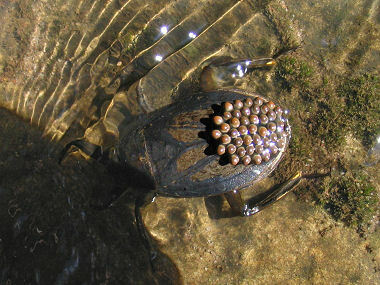 Though not dangerous to humans, the Ferocious Water Bug can deliver a painful bite if handled carelessly. Ferocious Water Bugs eat a variety of aquatic arthropods, and small fish, and as the largest of the true bugs, it's big enough to eat tadpoles and salamanders as well. The bug uses its powerful, hooked front legs to capture and hold its prey. The bug begins its life as an egg. After laying the eggs, the female cements them to the back of the male who carries them around until they hatch (as can be seen in the photo below).